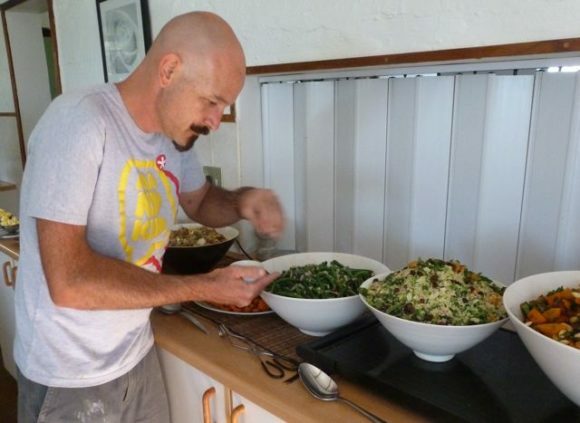 Paul Atkinson created a number of recipes set to feature in the BRC’s third vegetarian cookbook. He returns regularly, with his yoga teacher wife, Amy Best. They teach Pudding and Prana. 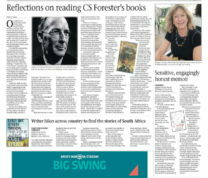 This story was first published on examiner.com (South Africa Travel). Seated in the dining room on night one, comparing destinations and expectations over butternut and pumpkin soup, fresh-baked focaccia, an assortment of cheeses running from Brie and Camembert to several hard and cheddar-like and soft (goat-milk) varieties, fresh fruit and salads and sundry “extras” including honey collected from hives at a nearby farm, is a yoga teacher from Maine and a yoga enthusiast from Seattle. Quiet Food and The Cake the Buddha Ate. Others here for the three day Pudding and Prana cooking and yoga weekend — at the Buddhist Retreat Center (BRC), an oasis in rural KwaZulu-Natal, South Africa — include a doctor from the UK, a human rights activist from Slovenia, an author who lives part-time in San Francisco and a Portuguese-speaking couple from Mozambique. The rest of the full-house of participants for Paul Atkinson and Amy Best’s “Yoga for the body and food for the soul” weekend have made the trek from around South Africa. From Durban it is about a 90 minute drive, if you’re not low-flying. The latter part is along a winding and at times hair-raisingly undulating tarred and less-traveled country road to this tranquil haven near Ixopo. For more in the BRC see: World’s Best Meditation Retreats: South Africa’s Buddhist Retreat Center. The BRC, established more than 30 years ago, is essentially the home of Buddhism in South Africa. Thanks to its visionary founder, architect, engineer and Buddhism teacher Louis van Loon, it has, since early days, drawn teachers and students from around the world. Like the place, a gentle escape in harsh surroundings, it seems something of a miracle that so many find their way here. An interest in mindfulness helps. Paul and Amy talk Buddhism in the studio. Not that you need to be a Buddhist or even a meditator to book in. An interest in mindfulness helps. And in being nurtured and well-fed. The Pudding and Prana teaching pair are well known at the BRC. He is UK-born but grew up in South Africa and studied mechanical engineering at the University of Cape Town. She is from Maine in the US. They met in the England, in York, while studying acupuncture. They married there in 2008 and came together to South Africa in 2013, she via a trip to visit her US family and a yoga intensive in India. He had learned to cook in a seasonally focused cafe-bistro in York with an eclectic menu. She learned the practice of yoga — all over. The two of them spent 15 months at the BRC, Atkinson running the kitchen, learning from and overseeing the small team of local Zulu “kitchen ladies,” as they are fondly know, stalwarts of the kitchen; Best handling reservations and teaching yoga. Kitchen prep at the Buddhist Retreat Center. Atkinson and Best are now teaching yoga (her) and doing acupuncture and cooking (him) from their own home base in Underberg, a country town that is a fair drive, but not too far, from the BRC. Being chief cook at the BRC was very different, Atkinson says, from what he did in the UK. Turning out delicate little cakes, for example, when on patisserie chef duty, compared to serving up big quantities of delicious, seasonal, rib-sticking comfort food and nightly soups, many of them made with recipes from the two cookbooks the BRC had already produced when he arrived there: Quiet Food and The Cake the Buddha Ate. Plentiful: The Big Book of Buddha Food (Jacana) was due out for release in November 2016; with the official launch in December 2016. Weekends at the BRC all follow a similar schedule, starting with an early morning wake-up to yoga or chi kung and ending with a talk in the studio followed by a meditation session. There is “noble silence” — a time to stop the external chatter and notice the head chatter — from after the evening session till after breakfast the follow morning. Quiet relief! Whatever the weekend is, be it bird watching or painting — or something more strictly Buddhist: Zen, Tibetan, Theravadan, Pure Life or some other orientation — you do a fair amount of “that” in between. Pudding and Prana had us do a lot of yoga with Best and cooking demos (followed by eating) with Atkinson. Vegetarian curries and a Moroccan stew. A beet and feta salad. A “bejeweled’ cous cous. Poached pears in a yummy rich chocolate baked pie topped with whipped cream blended with double-cream yoghurt. All were recipes he had perfected while working in the BRC kitchen. Log into the Buddhist Retreat Center website for more information and to book. Oh, and the 30-something retreatant from Seattle? After spending a month as a volunteer in a township near Cape Town, and having read about the BRC, she made the trip to the valley and spent 10 days at the BRC, during which she did two weekend retreats. Then she was heading to Durban to catch the BAZ bus back to Cape Town, with stop-offs. She would then return home. Hopefully enlightened by her unusual South African safari. Story and pictures © Wanda Hennig, 2016: author of Cravings: A Zen-inspired memoir about sensual pleasures, freedom from dark places, and living and eating with abandon (Say Yes Press).